These vibrant red pumps were probably made in London and are similar in style to shoes by London shoemakers, Chamberlain and Son, from the same time period. 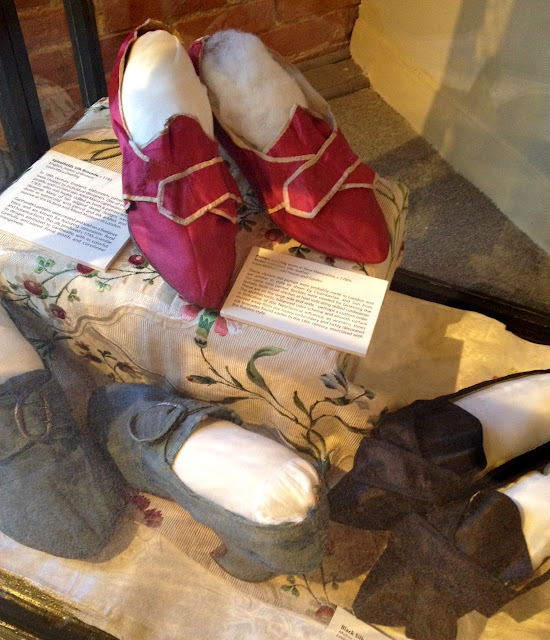 Red continued to be a popular color for women's shoes, even wedding shoes, throughout the 18th century. Buckles were needed for fastening the lachets or straps. They are lined with linen and feature the minute stitches at heel indicating the work of a skilled cordwainer. The shoes are on the large side and wide, indicating a custom or bespoke order. The architectonic, balanced color scheme and smooth surface is indicative of the Neoclassical influence, as women's shoes moved away from the heavy embroidery and richly decorated silk brocades found earlier in the 18th century, associated with the Rococo style. 1. I will discuss many examples of red Georgian shoes in my forthcoming book, "Georgian Shoe Stories from Early America" Johns Hopkins University Press, 2018.